Journal of the House of Commons: Volume 4, 1644-1646. Originally published by His Majesty's Stationery Office, London, 1802. Die Lunæ, Decembris 30, 1644. 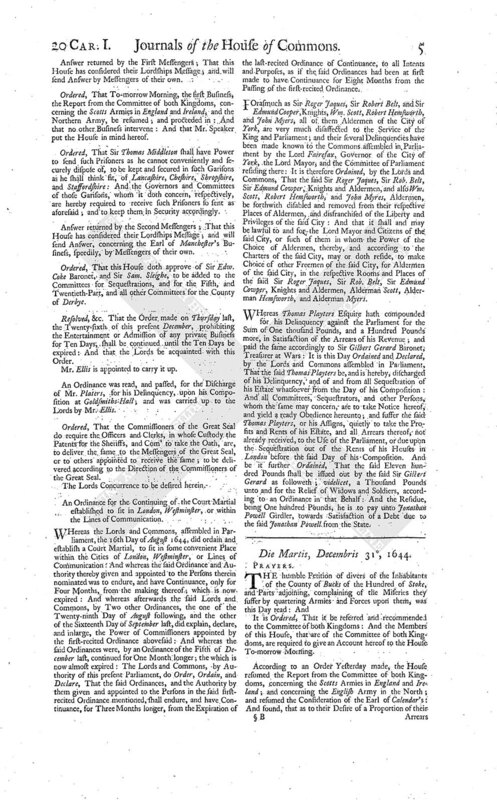 An Ordinance for Continuance of the Ordinance for Martial Law was this Day read; and, upon the Question, passed; and ordered to be sent unto the Lords for their Concurrence. Sir Rob. Pye is appointed to carry it up to the Lords. Ordered, That the Commissioners for Martial Law do bring in an Explanation upon such Articles in the Commission as seem doubtful unto them. A Commission from the King to Captain Collyns of Kent, to do him Service in that County, was read; and immediately re-delivered unto Sir Hen. Heyman. Resolved, &c. That the House doth approve of the Exchange of Colonel Jo. Bellassys, Prisoner to the Parliament, for Serjeant Major Carre, Captain Aiscough, and Mr. Rich. Stevens, Prisoners to the King's * * *. My Lord General to be acquainted herewith. Sir Ralph Asheton presented the Duchy-Seal: Which is ordered to be sealed up, and left in the Custody of Mr. Speaker, till the House take further Order. Two intercepted Letters from Chard, of Decembris 25, from Colonel Edm. Wyndham to Sir Jo. Berkeley, Governor of Exeter, and Mr. John Coventry. Ordered, That it be referred to the Committee of the West, to examine the Miscarriages in the coming back of the Forces sent down into the West; and to take care of sending down a further and a considerable Party; and to consider of an Expedient, and present to the House, for raising of Monies to carry on the Service of the West effectually. An Ordinance for Disabling and Disfranchising of Sir Roger Jacques, Sir Rob. Belt, Sir Edm. Cowper, Wm. Scott, Rob. Hemsworth, and Jo. Myers, Aldermen of the City of Yorke, was this Day read; and, upon the Question, passed; and ordered to be sent unto the Lords for their Concurrence. Sir Wm. Strickland is appointed to carry it up. Ordered, That the Committee for the West, and the Committee for the Counties of Sussex, Surry, and Hants, may meet this Afternoon, to consult of preparing and sending down the Dragoons appointed to be furnished by those Counties; and likewise to consult and consider of sending down Monies speedily to Lieutenant General Middleton, formerly recommended by this House to the Committees of Hantshire, to be raised by them. The Lords desire this House to return an Answer to their Message on Saturday, concerning the Sparing the Life of Sir Jo. Hotham; in regard he is much streightened in Time, and has formerly deserved very well of the Parliament. The Lords having long since, at a Committee of both Houses, delivered unto you a Narrative of the Earl of Manchester; the Lords do desire, that this House will take it into as speedy Consideration as may stand with their Conveniency; and give an Answer unto it. Ordered, That the Report, concerning the Narrative of the Earl of Manchester's, be made on Wednesday Morning next. Sir Philip Stapilton, Tellers for the Yea: 46. Sir Jo. Evelyn, Tellers for the Noe: 94. So that the Question passed with the Negative. Mr. Nicoll went up to the Lords, to * * * *. Answer returned by the First Messengers; That this House has considered their Lordships Message; and will send Answer by Messengers of their own. Ordered, That To-morrow Morning, the first Business, the Report from the Committee of both Kingdoms, concerning the Scotts Armies in England and Ireland, and the Northern Army, be resumed; and proceeded in: And that no other Business intervene: And that Mr. Speaker put the House in mind hereof. Ordered, That Sir Thomas Middleton shall have Power to send such Prisoners as he cannot conveniently and securely dispose of, to be kept and secured in such Garisons as he shall think fit, of Lancashire, Cheshire, Shropshire, and Staffordshire: And the Governors and Committees of those Garisons, whom it doth concern, respectively, are hereby required to receive such Prisoners so sent as aforesaid; and to keep them in Security accordingly. Answer returned by the Second Messengers; That this House has considered their Lordships Message; and will send Answer, concerning the Earl of Manchester's Business, speedily, by Messengers of their own. Ordered, That this House doth approve of Sir Edw. Coke Baronet, and Sir Sam. Sleighe, to be added to the Committees for Sequestrations, and for the Fifth, and Twentieth-Part, and all other Committees for the County of Derbye. Resolved, &c. That the Order made on Thursday last, the Twenty-sixth of this present December, prohibiting the Entertainment or Admission of any private Business for Ten Days, shall be continued until the Ten Days be expired: And that the Lords be acquainted with this Order. Mr. Ellis is appointed to carry it up. An Ordinance was read, and passed, for the Discharge of Mr. Platers, for his Delinquency, upon his Composition at Goldsmiths-Hall; and was carried up to the Lords by Mr. Ellis. Ordered, That the Commissioners of the Great Seal do require the Officers and Clerks, in whose Custody the Patents for the Sheriffs, and Com' to take the Oath, are, to deliver the same to the Messengers of the Great Seal, or to others appointed to receive the same; to be delivered according to the Direction of the Commissioners of the Great Seal. The Lords Concurrence to be desired herein. 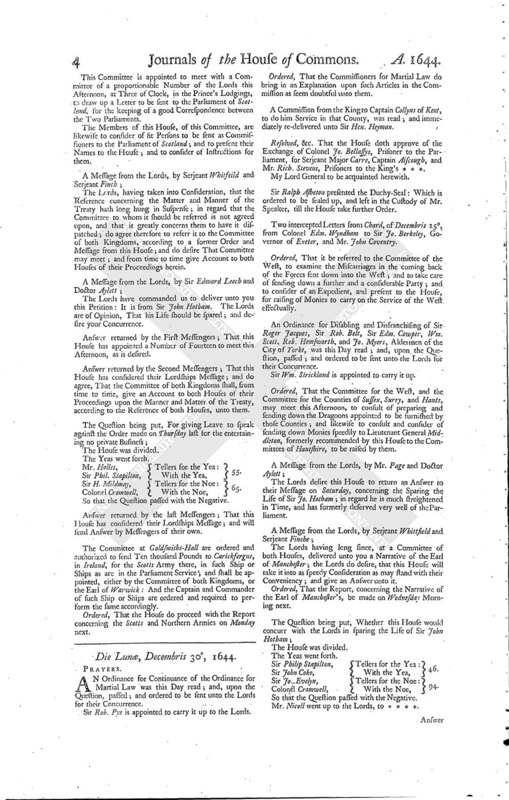 An Ordinance for the Continuing of the Court Martial established to sit in London, Westminster, or within the Lines of Communication. Whereas the Lords and Commons, assembled in Parliament, the 16th Day of August 1644, did ordain and establish a Court Martial, to sit in some convenient Place within the Cities of London, Westminster, or Lines of Communication: And whereas the said Ordinance and Authority thereby given and appointed to the Persons therein nominated was to endure, and have Continuance, only for Four Months, from the making thereof; which is now expired: And whereas afterwards the said Lords and Commons, by Two other Ordinances, the one of the Twenty-ninth Day of August following, and the other of the Sixteenth Day of September last, did explain, declare, and inlarge, the Power of Commissioners appointed by the first-recited Ordinance abovesaid: And whereas the said Ordinances were, by an Ordinance of the Fifth of December last, continued for One Month longer; the which is now almost expired: The Lords and Commons, by Authority of this present Parliament, do Order, Ordain, and Declare, That the said Ordinances, and the Authority by them given and appointed to the Persons in the said firstrecited Ordinance mentioned, shall endure, and have Continuance, for Three Months longer, from the Expiration of the last-recited Ordinance of Continuance, to all Intents and Purposes, as if the said Ordinances had been at first made to have Continuance for Eight Months from the Passing of the first-recited Ordinance. Forasmuch as Sir Roger Jaques, Sir Robert Belt, and Sir Edmund Cooper, Knights, Wm. Scott, Robert Hemsworth, and John Myers, all of them Aldermen of the City of York, are very much disaffected to the Service of the King and Parliament; and their several Delinquencies have been made known to the Commons assembled in Parliament by the Lord Fairefax, Governor of the City of York, the Lord Mayor, and the Committee of Parliament residing there: It is therefore Ordained, by the Lords and Commons, That the said Sir Roger Jaques, Sir Rob. Belt, Sir Edmund Cowper, Knights and Aldermen, and also Wm. Scott, Robert Hemsworth, and John Myres, Aldermen, be forthwith disabled and removed from their respective Places of Aldermen, and disfranchised of the Liberty and Privileges of the said City: And that it shall and may be lawful to and for-the Lord Mayor and Citizens of the said City, or such of them in whom the Power of the Choice of Aldermen, thereby, and according to the Charters of the said City, may or doth reside, to make Choice of other Freemen of the said City, for Aldermen of the said City, in the respective Rooms and Places of the said Sir Roger Jaques, Sir Rob. Belt, Sir Edmund Cowper, Knights and Aldermen, Alderman Scott, Alderman Hemsworth, and Alderman Myers. Whereas Thomas Playters Esquire hath compounded for his Delinquency against the Parliament for the Sum of One thousand Pounds, and a Hundred Pounds more, in Satisfaction of the Arrears of his Revenue; and paid the same accordingly to Sir Gilbert Gerard Baronet, Treasurer at Wars: It is this Day Ordained and Declared, by the Lords and Commons assembled in Parliament, That the said Thomas Playters be, and is hereby, discharged of his Delinquency, and of and from all Sequestration of his Estate whatsoever from the Day of his Composition: And all Committees, Sequestrators, and other Persons, whom the same may concern, are to take Notice hereof, and yield a ready Obedience hereunto; and suffer the said Thomas Playters, or his Assigns, quietly to take the Profits and Rents of his Estate, and all Arrears thereof, not already received, to the Use of the Parliament, or due upon the Sequestration out of the Rents of his Houses in London before the said Day of his Composition. And be it further Ordained, That the said Eleven hundred Pounds shall be issued out by the said Sir Gilbert Gerard as followeth; videlicet, a Thousand Pounds unto and for the Relief of Widows and Soldiers, according to an Ordinance in that Behalf: And the Residue, being One hundred Pounds, he is to pay unto Jonathan Powell Girdler, towards Satisfaction of a Debt due to the said Jonathan Powell from the State.